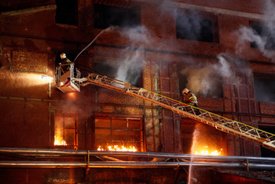 Legal news for Pennsylvania work-related firefighter death attorneys –Firefighter injured in 4-alarm inferno in Washington County, PA.
Washington County, PA (NewYorkInjuryNews.com) – A vicious four-alarm fire torn apart a bar and injured one firefighter in Washington County Saturday afternoon, February 20, 2010, as reported by the Pittsburgh Tribune-Review. Firefighters were called to the scene at Gabby’s Quick 6 bar at 685 W. Chestnut Street, where apartments were above and attached to the quickly burning building. They rushed to the blaze and quickly prepared to extinguish the deadly flames. The fire was reported to have broke out around 5:30 p.m. It was not reported if the residents living in the apartments were previously evacuated, or if the building was unoccupied at the time the fire occurred. Emergency medical services (EMS) arrived at the scene to assist with any injured victims in the four-alarm blaze. One of the firefighters battling the furious inferno suffered an eye injury. He was taken via ambulance to be cared for by doctors and nurses at an area hospital. His identity was not disclosed. It was reported that the fire displaced 13 residents from their homes. It was not known how the fire broke out and what caused it. Fire investigators continue to probe the scene to determine what occurred.